It is a fairly safe bet that following a rainstorm there will be a new treasure of blooms at Caddo Mounds State Historic Site. Earlier this week, I stumbled across a sunny patch of copper lilies (pictured at right). These beauties cropped up in close proximity to a 1920s-era barn near our main road segment of El Camino Real de los Tejas. Seeing these lilies so close to the barn had me wondering if they were one of the blooms that help archeologists spot historic home sites. I bounced this thought off my archeologist husband and got a "probably not." There are plenty of flowers that are known for marking historic house sites, but apparently not the copper lily. NUESTRO PADRE SAN FRANCISCO DE LOS TEJAS MISSION. Nuestro Padre San Francisco de los Tejas Mission, originally established in 1690 as San Francisco de los Tejas Mission, was near the west bank of the Neches River in what is now Houston County. It was given the longer name when it was reestablished in 1716 by the expedition of Domingo Ramón and moved across the Neches River to Bowles Creek, in what is now Cherokee County. Fray Francisco Hidalgo and Fray Isidro Félix de Espinosa were placed in charge. In 1719, because of the French invasion from Louisiana, the mission was again abandoned. It was reestablished in 1721 by the Marqués de San Miguel de Aguayo, who moved it to a new location and renamed it San Francisco de los Neches. 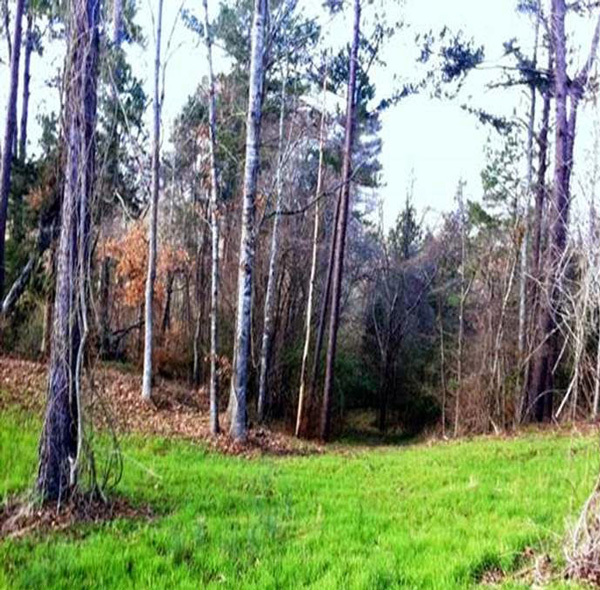 Also, the Caddo Mounds area was known by the Spanish as a paraje, or perpetual campground, a welcome high, dry spot to rest following a perhaps muddy and difficult crossing of the nearby Neches River. Another interesting tidbit: Father Margil, a Franciscan friar and friend of the Espinosa party who established Mission Tejas, spent much time in Central America and East Texas. Stories of the miraculous work of Father Margil are folk legend around East Texas, especially in Nacogdoches where this historical marker resides along the Lanana Creek Trail. "Los Ojos de Padre Margil" (The Eyes of Father Margil) – A Franciscan missionary who spent almost 50 years with the Indians of Central and North America, Father Antonio Margil de Jesus (1657-1726) was born in Valencia, Spain, and came to the New World in 1683. He founded three Catholic colleges before joining the Domingo Ramon Expedition to East Texas in 1716. He established three missions in this region, including Nuestra Senora de Guadalupe at present Nacogdoches. A severe drought, which began in 1717, ruined crops and caused many Indians to leave the mission. In the summer of 1718, according to tradition, Father Margil was led by a vision to a point near this site where the bed of La Nana Creek made a sharp bend. There he struck the overhanging rock shelf with his staff, and a stream of water gushed forth. Some accounts say that he made two openings in the rock, which became known as "The Eyes of Father Margil." This miraculous event inspired the Indians, and a relief expedition later found conditions at the mission greatly improved. In 1720, Father Margil founded Mission San Jose y San Miguel de Aguayo in San Antonio. He died in Mexico City. "The Holy Spring," now dry except during very rainy weather, symbolizes the faith and endurance of the Spanish missionaries. Espinosa also wrote a book, The Exemplary Life of the Venerable Father Friar Antonio Margil de Jesus, about his friend's missionary work. 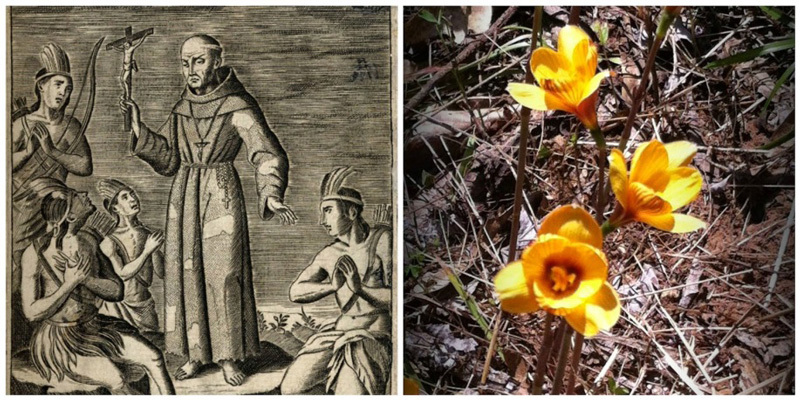 In reality, these puzzle pieces of knowledge may never fit together, but it is intriguing to imagine the ancestor bulbs to our copper lilies arriving at Caddo Mounds in the robes of Father Margil—perhaps on a trip to visit his friend Espinosa. 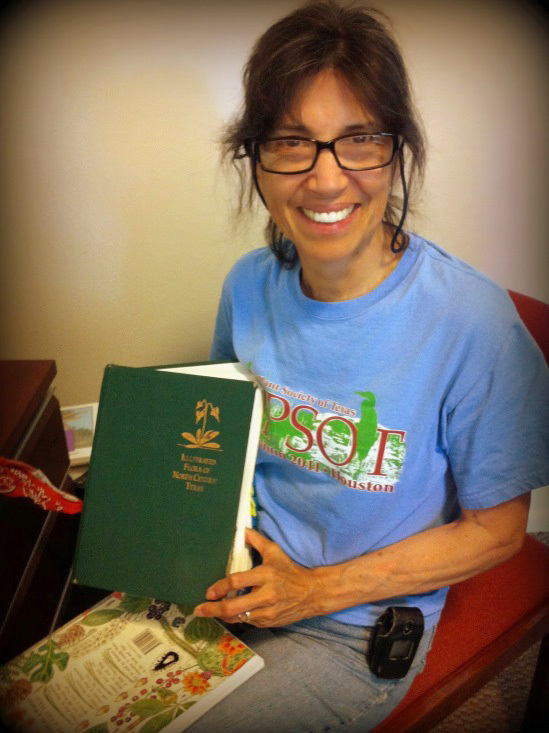 Sonnia Hill with the Native Plant Society of Texas.